Submitted by Kstudio on Mon, 2009-06-29 20:04. Really computers Dell such unreliable? For 10 years of use non-brand computers at me only 2 times broke motheboards. Upgrade workstation as a rule happens not more often than an once in a year. then half a year , certainly if computers do not break too often. Submitted by trick on Sat, 2009-06-27 05:09. That is a nice move ! But why not make some sort of transfer tool. Autodesk offers 2 authorisations when you are on subscription and also offers the PLU utility to transfer licenses yourself. So obviously there should at least be the possibility to do this for plugins. You can also build in a check whether one license with the same serial is used twice on the network, and therefore can not run. You can even generate a personalized key that can only be run on the network once: if this key is illegally used you simpy lose your license !! I only need 1 license with 2 authorizations for work and home. But when I have computer trouble I really hope problems can be solved and are not limited by past authorizations !! Especially since network adapters in my DELL machines are integrated on the motherboard !! I did not have PC problems for quite some while but WHEN I have them they mostly come in waves. Submitted by Kstudio on Sat, 2009-06-27 04:51.
but not earlier than in 6 month or rarely. Maximum quantity of licences for the user - 5. Submitted by trick on Sat, 2009-06-27 02:01. The price for this script is perfectly OK...licensing surely NOT ! Submitted by Saetar on Fri, 2009-06-26 03:28. FilePathFinder is the best script in the class for operations with external files and is better than Relink Bitmaps, r7_relink_assets and others. I seldom buy something, but this script I recommend to buy all. Submitted by Kstudio on Fri, 2009-06-26 03:17. Yet did not meet analogues FilePathFinder with the same possibilities. Allow to search missing files, collect and sort files by filetype? Choosing objects by their connection with file? Have possibility conveniently to look through bitmaps? 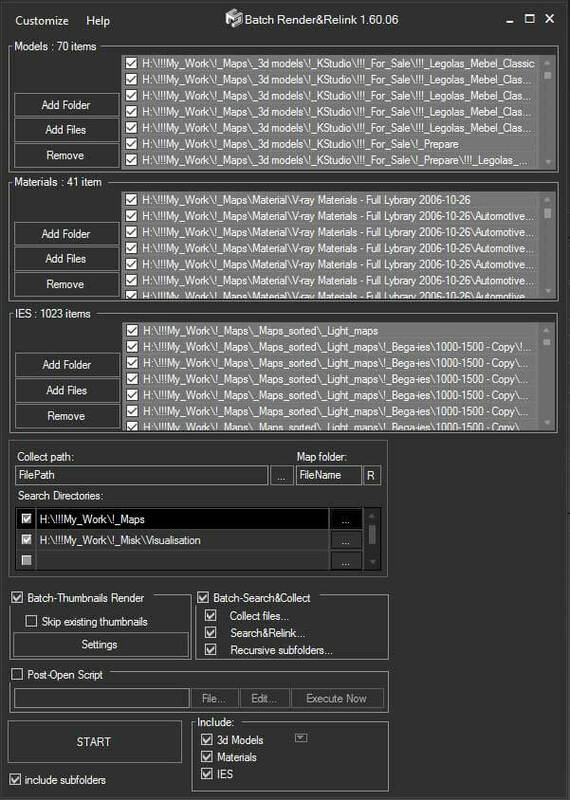 To open bitmaps in Editors? Elaboration of xRef files in automatic mode? Renaming the links by mask? Submitted by kutsanan on Fri, 2009-06-26 01:10. 36 dollars agaist free Relink script?